A group of Indianapolis Metropolitan Police Department officers are assigned to a unit that hopes to solve the problem of homelessness in the city. 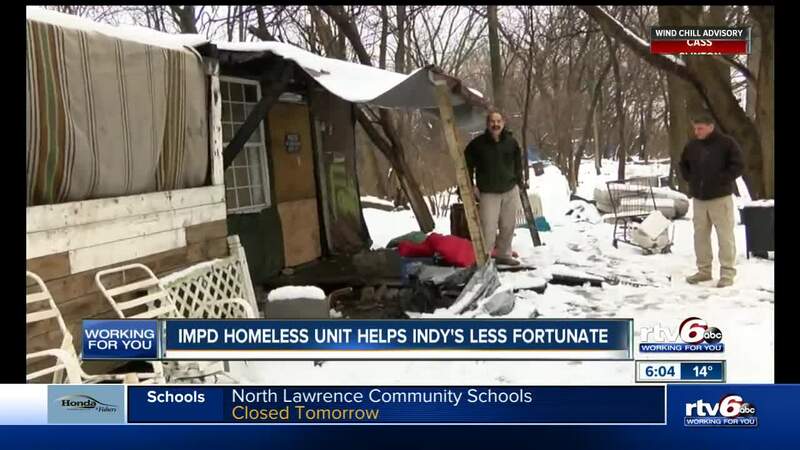 INDIANAPOLIS — A group of Indianapolis Metropolitan Police Department officers are assigned to a unit that hopes to solve the problem of homelessness in the city. IMPD officer Phillip Smiley if just one of the officers assigned to the homeless unit. Smiley and other officers visit homeless camps with Eskenazi Health and The Pourhouse members. The goal is to help check on people and provide mental health evaluations and housing applications. "When we're out here to look for new homeless people that aren't skilled at being homeless and they're vulnerable to the environment,” Smiley said. While there is a decline in overall homelessness in Indianapolis, data shows there are almost 1,700 homeless on any given night. “Really targeting people with mental health issues, addiction issues, and then try to connect them to resources, services and ultimately housing,” Rebekah Bricker, a crisis specialist at Eskenazi Health Midtown said. For Smiley and the other IMPD officers, they say they are working to solving homelessness. “We're trying to solve an issue,” Smiley said. “A long-term issue with a long-term solution rather than just arresting our way out of a problem." In 2018, there was an 8 percent increase in unsheltered homeless individuals. For more information on services and shelters in Indianapolis, you can view them online.